It’s been a few weeks since I released milestone 3.1, so it’s time to start talking about what’s coming down the pipe. 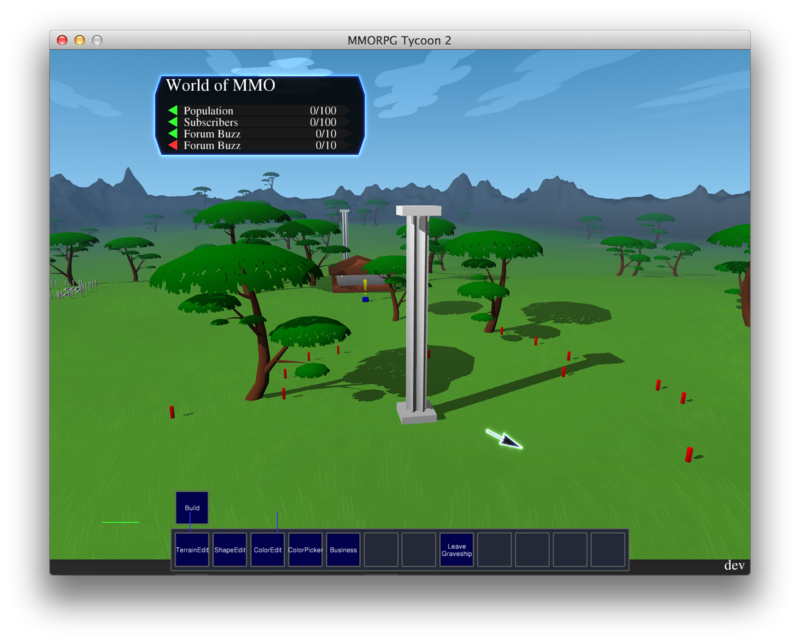 Milestone 1: This first milestone build of MMORPG Tycoon 2 was a very basic proof-of-concept which showed off the general UI style I was imagining for the game, and had some rudimentary simulated player AI. This was back in the early days, in the first design for the game, where the game was to be played from a “first-person” point of view — you flew around on a “graveship” in order to give yourself a nice vantage point, and “painted” the terrain as if it was a large image. This build showed up a lot of problems in the VectorStorm engine’s underlying rendering technology, which have now long since been patched up. This milestone build was intended to be a miniature sample of the full game; the player taking control of a single region, building it out, and getting a certain number of players to complete it within a certain period of time. It didn’t end up coming together in a timely manner, though, so it became merely a “technology demo”. Milestone 3: This most recent milestone was by far the biggest of any of these milestone builds. 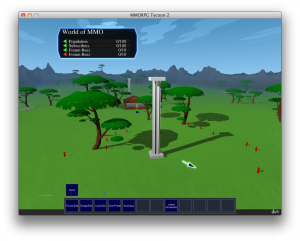 Milestone 3 was my “Terrain” milestone, intended to act as a proof of concept for MMORPG Tycoon 2’s terrain rendering systems. This build contained the new terrain editing engine (which squashes saved games and scenarios down into only a few hundred kilobytes, instead of the 600 megabytes which would have been required for saving the world of one of the earlier builds). This also added the ability to activate new regions, the original game’s “overloading regions” game mechanic, subscriber AI which actually resulted in subscribers outleveling a region and moving on, basic quest editing, subscriber pathfinding to avoid mountains, and heaps more. Also new in this build was the new control style which allows free-zoom from ground level right up to a complete world view. This was an extremely scary design choice for me, but I felt like it’s the only true option for the game, since it was also the core interface design for the original MMORPG Tycoon game. Since Milestone 3, I’ve been working on little bits and pieces. 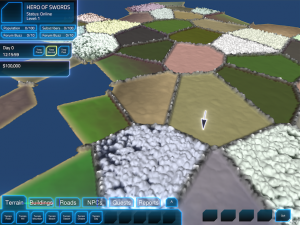 One of these little bits has been further refinements to the terrain system. I’ve made some changes which make the terrain look better from high up, some optimisations which result in the initial map building substantially faster, as well as changes which make the map render faster, and should allow you to look around at any distance from the ground instead of being forced into a downward-pointing camera. I haven’t yet written final camera control for that last bit, or hooked up the terrain systems to be completely bullet proof in terms of making sure that there’s terrain to cover whatever direction you look (and I’ll need to work out a new cheat to make the sky work), but that all looks possible right now. 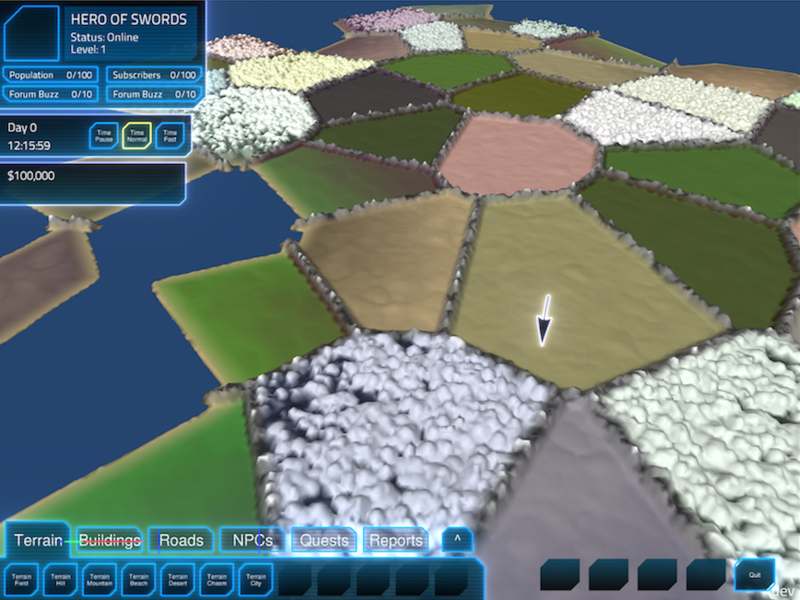 I’ve also been working on some new terrain types, which I’ll show in future screenshots. Finally, I’m not really happy with the floating tags that I used to allow you to select whole “regions” in the milestone 3 build, and so I’ve been investigating alternate methods to select regions and show information about their status, but I don’t yet have a solid alternative. I’ll update on this as I go. 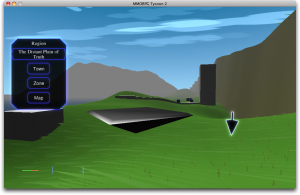 Milestone 4: Milestone 3 was the “Terrain” milestone, designed to proof-of-concept everything to do with terrain. It doesn’t contain every terrain type that will be in the final game, but it shows approximately how terrain will work in the final game. In the same way, Milestone 4 will be the “City” milestone. Milestone 4 will be for proving out my systems for placing settlements, villages, cities, and other in-game feature locations. Roads, walls, rivers, and monster zones (however those are handled) will all be included in this. A future post (probably tomorrow?) will go into the specifics of my designs for how I’m planning to make city editing work. Milestone 5: Milestone 5 will be the “Scenario” milestone. All the basics of the core game mechanics will have been laid out in milestone 4, so milestone 5 will introduce the “meta-game” mechanics: scenarios, quests, VIP demands, and an initial tutorial. The overall game structure surrounding the main simulation. Milestone 6: Milestone 6 will probably be the alpha build. It will be focused on tuning, AI, GUI, polish, extra content for terrain types and building types, as well as any other remaining tasks. I expect that Milestone 4 will take me a fair amount of time — there’s a lot of core design work to be tackled during that. Milestones 5 and 6 should be faster. And then there will be another slow period, as I work my way from alpha to beta. My plan is to keep public builds up on this site for feedback at least until alpha, and then we’ll see what happens after that. So I have a busy year in front of me. Hope you all stick with me for the rest of this adventure! 21 January, 2014 in Full Games, MMORPG Tycoon. ← And a new server.